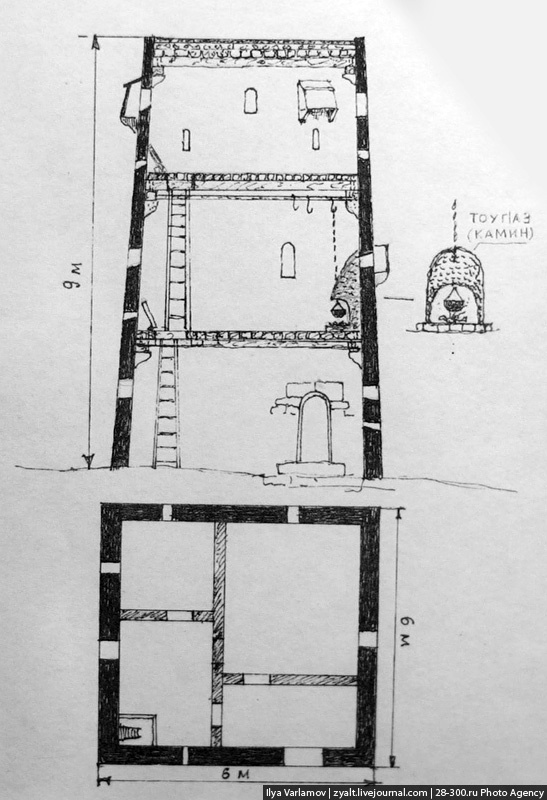 Clan towers – родовые башни – or, named after the people building them, Vainakh towers, combined multiple functions. They were living towers, impregnable fortifications, watchtowers dominating the valley controlled by the clan. And last but not least sacred asylums where blood-revenge was forbidden. Ismail Kadare in his Broken April tangibly describes the asylum towers that once stood all over the Albanian mountains and where men sometimes lived for years without ever coming out. Nowadays, most towers are uninhabited. The clan wars and external threats being over, the Ingushes went down to live in the more fertile river valleys. There are only a few old people sticking to their dwelling place or some shepherds left around to take care of them. More information at the link. And more photos. I find the landscape almost as fascinating as the architecture. 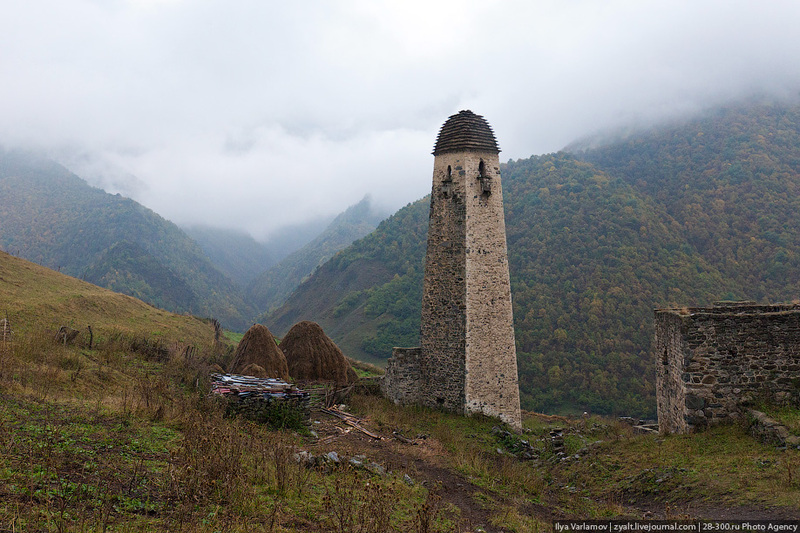 During WWII the Ingush and Chechen people, following the tradition of several centuries of wars of independence, rose up against the Soviet power. This is why after the war Stalin deported both nations to Kazakstan, and settled Russians on their place. The survivors of the cruel deportation were permitted to return to their native land only by Khrushchev in the late 1950s. 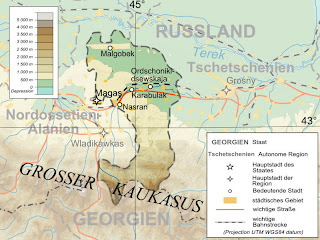 However, in the meantime a part of Ingushetia, including their former capital Vladikavkaz, and even the town of Ongush (in Russian Tarskoye) which had given name to the whole republic, were annexed by the Soviet authorities following the old policy of divide to the western neighbor, Northern Ossetia: this is the egg-shaped hole on the map of the republic. More at the link, including some photos of, and observations about, Ingush weddings. "Ah yeah, the kulla! 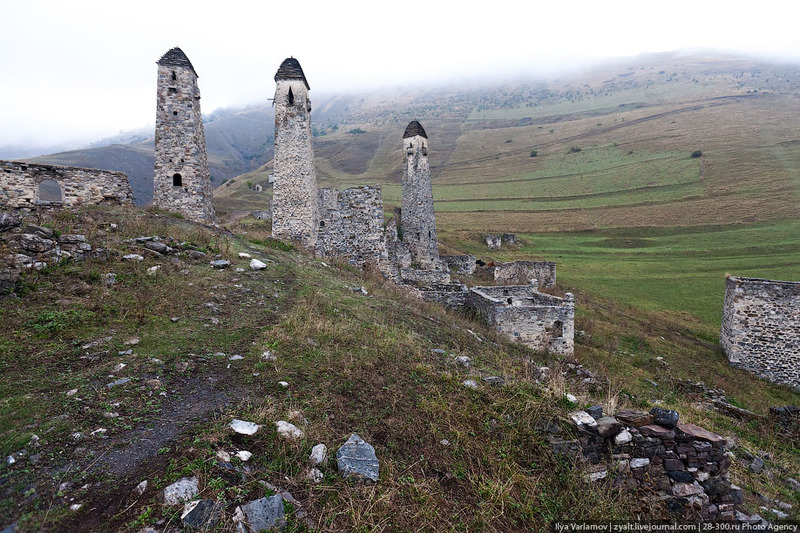 They're really cool, and much as the article describes, although the similarities between the Vainakh towers and the Albanian kulla are coincidental. The Caucasus had no control contacts with northern, mountainous Albania, where the kulla really took root, but they clearly both served the same purpose—both areas developed elaborate honor codes and clan systems, and both had devastating blood feuds. Albania still deals with the problem of blood feuds to this day, Ingushetia probably does too. Incidentally, the kulla had their modern incarnation in the Communist dictator Enver Hoxha's crazy scheme to cover the entire Albanian country in cement bunkers, nearly one for every three Albanian citizens, out of some crazed delusion that Albania was going to be invaded and people could take up arms and defend the country in the bunkers. There's so many of them and they're so solidly constructed that almost none have been removed so far—it would be ruinously expensive. So pretty much anywhere in the country that you stand, you see a bunker." Kulla - "god of builders in the Mesopotamian mythology. He is responsible for the creation of bricks, and as a Babylonian god, restores temples." "Yakut woman wearing festive costume"
Get your prostate checked !! Where does the Chamber of Commerce get its money? The "Bearded Lady of Naples"
"Mother Mary comes to me..."
Eliminate tax deduction for mortgage interest ?? This sport is called "speedflying"